There are literally hundreds of amazing wedding venues for hire across London, we have listed a few of our favourite London Wedding Venues below. One Mayfair, formerly St. Mark’s Church was constructed between 1825 and 1828 in order to tackle the shortage of ‘church sittings’ in the area. At the time, the population in Mayfair had grown as a result of aristocrats and the wealthy from the country seeking city residences. The Grade I listed building was constructed in Greek revival style to the designs of John Peter Gandy. Gandy was highly regarded in Greek architecture and produced most of his work in neo-classical designs, with One Mayfair being one of the finest examples. Imagine your guests’ reaction as they ascend the grand steps of the Waterhouse Building. Greet them with canapés, drinks and entertainment. Then, serve dinner in the magnificent surrounds of Hintze Hall (formerly the Central Hall), under the watchful eye of our resident Diplodocus. What other venue can offer that? 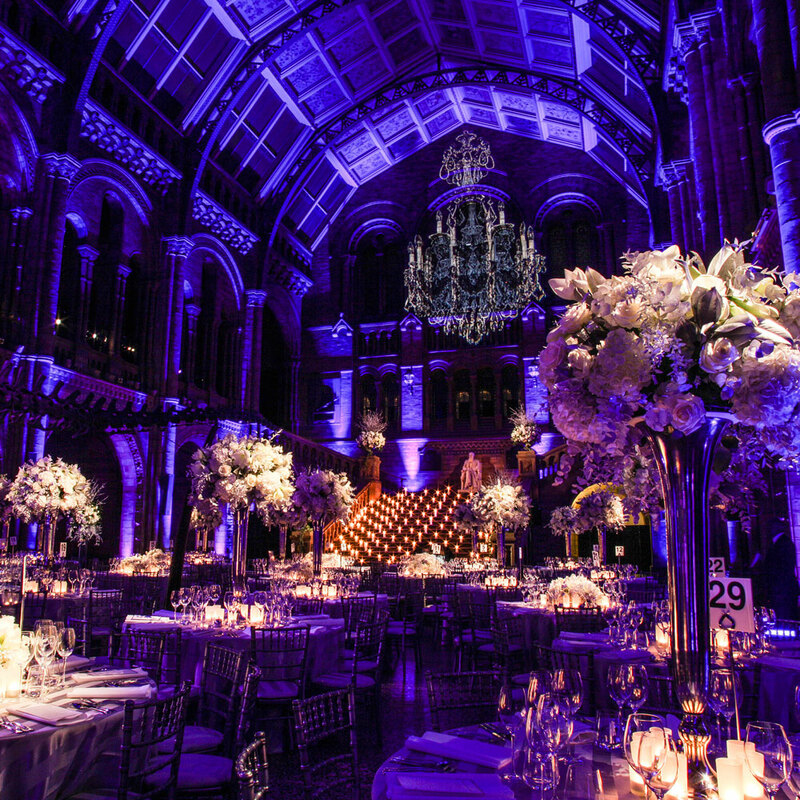 The icing on the cake… A twinkling floor adds drama to Hintze Hall or, for a wedding or civil partnership reception that is out of this world, impress your guests in our magical Earth Hall, home to a giant globe sculpture and vast celestial wall map. 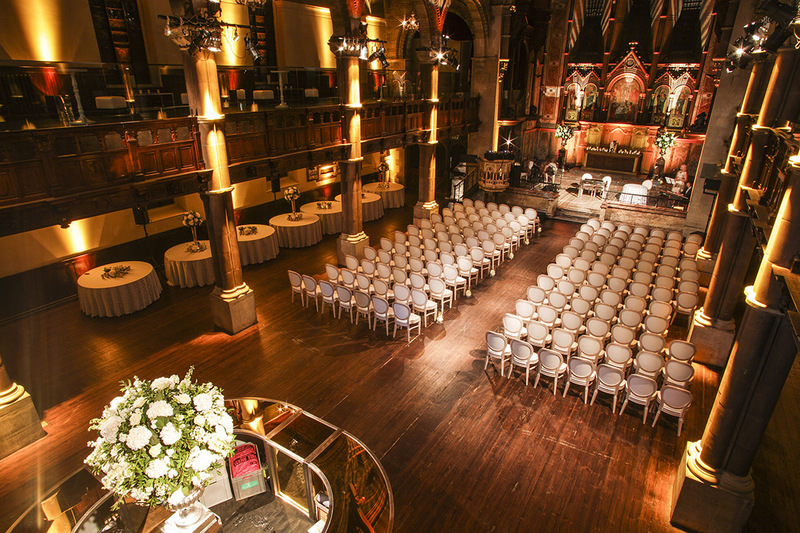 Travel through the globe into the upper galleries and you have access to other unique spaces for your special day. 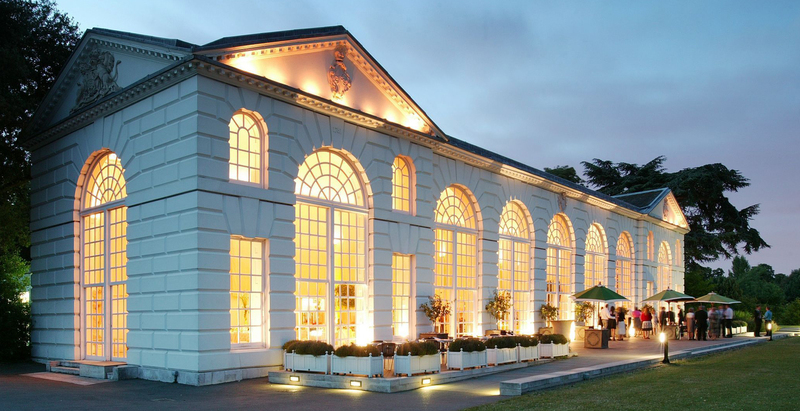 Built by Sir William Chambers in 1761, this stunning 18th century building was originally filled with citrus trees. The large, open plan design of this venue makes it ideal for a whole range of events, including award ceremonies and lavish corporate events. With high ceilings and grand, arched windows, the room is filled with an abundance of natural light. During the summer months, guests can enjoy the large terrace with its spectacular views of the landscape, with lights illuminating the surrounding trees at night. 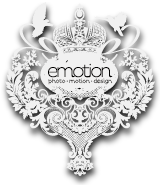 Hampton Court House is fully Licensed for civil wedding ceremonies. The House is a place of dreams. 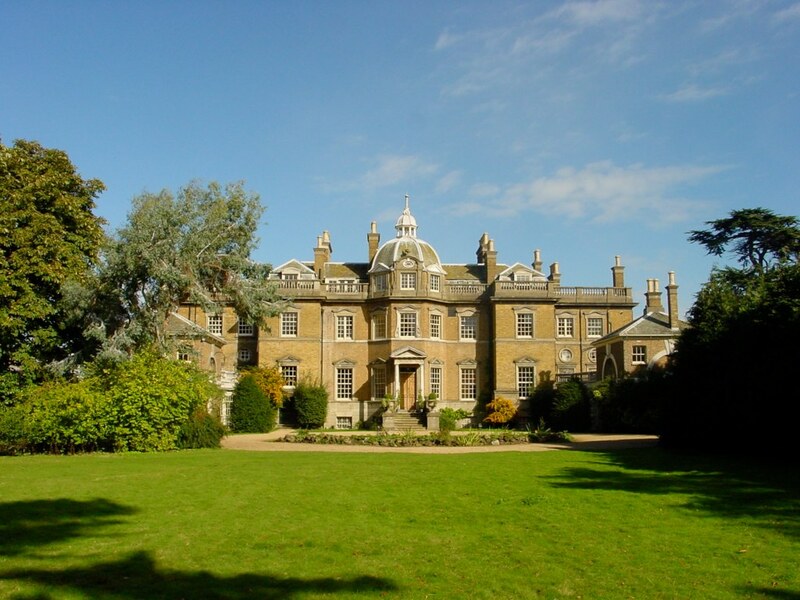 Set in 7 acres of magical 18th Century gardens, it is a hidden secret. The gardens are a sensory delight; palm trees rustling in the breeze, rabbits lazing in the sun, swans gracefully gliding across the heart-shaped lake. The sheer magnificence of the Banqueting House – built for entertaining – has dazzled revellers and guests of the monarch since the early 17th century. As you gather among family and friends to celebrate and begin a new life together, the Banqueting House’s timeless majesty offers a powerful reminder of precious links to the past. Whether you’d like a spectacular wedding or an intimate reception, the Banqueting House guarantees first-class service and an unforgettable backdrop for your very special occasion.